To ensure that your company’s listing is correct, please take the time to update your profile in the Members Only section of our website. 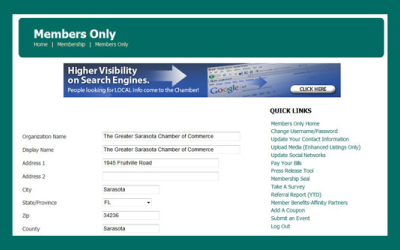 Go to www.sarasotachamber.com and log in using your company username and password. Once you’ve logged in, click on “Update Your Contact Information.” Simply update the fields that need correction and click ‘Save Change Requests.’ You can also take this opportunity to add/remove outdated employee information to make sure your staff is receiving all the benefits your Chamber membership provides. Primary Directory Listing: The directory lists all members under their selected category. Help readers find your business type by selecting the “primary directory listing” that’s right for you. We have hundreds of categories for you to choose from. Address, Website and Telephone: This information is important in guiding readers to learn more about your business. To maximize your visibility and business referrals, be sure your address, website URL and phone number is correct. Need help logging in to your profile? Contact Craig McGonigal at cmcgonigal@sarasotachamber.com or (941) 556-4034. Editor’s note 12/14/2015: The 2016 print directory has been printed and will be issued to members at the beginning of 2016. The 2016 Greater Sarasota Chamber Membership Directory is heading to the printer. Marketing the Greater Sarasota community is vital to attracting individuals and businesses interested in finding just the right place for work and play, and this comprehensive relocation tool reflects why our region is a great place to call home, as well as a great place to do business. Members will be listed alphabetically and by business category. Your listing will include your company name, address, telephone and website URL. Chamber Champions, Sarasota Tomorrow Next Investors and Trustees will also be noted with a special marking.